Description: This nudibranch is translucent white in colour with maroon-red spots on the tips of the ceratal tubercles and maroon pigment spots on the body. The cerata are bulbous, with few rows of blunt tubercles, becoming widest just below the tip. 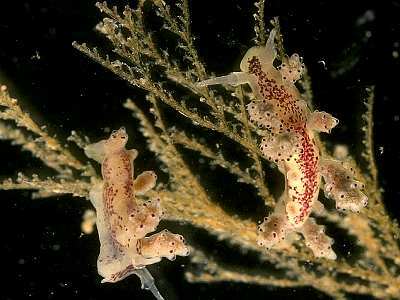 Habitat: Doto eireana is found exclusively on the hydroid Amphisbetia operculata which is found in places with strong water movement, usually in the infralittoral zone. Amphisbetia frequently grows on stipes of the kelp Laminaria hyperborea and on steep rockfaces exposed to wave action. The spawn is a white ribbon laid in concertina fashion. Distribution: Records of this species are few, mainly because of its recent separation from Doto coronata but it has been reliably reported from the west coast of Ireland and south-west England. White body with maroon spots on ceratal tubercles and body. Picton, B.E. & Morrow, C.C. (2016). Doto eireana Lemche, 1976. [In] Encyclopedia of Marine Life of Britain and Ireland.